AUGUST 18, 2008, JOHNSTOWN, PA — Veteran outdoor journalist Betty Lou Fegely of Walnutport, Penna. received the Professional Outdoor Media Association (POMA) Emerald Cornerstone Award for extraordinary volunteer service. 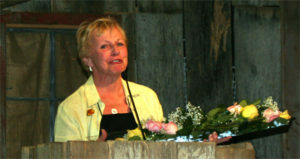 In addition, the prestigious award was renamed the Betty Lou Fegely Emerald Cornerstone Award. Fegely was honored during an emotional presentation by POMA Chairman Judd Cooney during POMA’s Third Annual Business Conference. Fegely is a founding board member of POMA and served as the organization’s first chairman and president. “Without Betty Lou , POMA would not exist,” Cooney said with tears in his eyes. He added that the board of directors voted unanimously to change the name of the award to the Betty Lou Fegely Emerald Cornerstone Award. The Professional Outdoor Media Association’s Emerald Cornerstone Award is presented to individuals whose volunteer efforts in assisting the organization go beyond the norm… they are extraordinary. 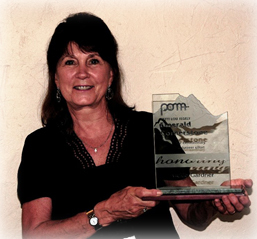 In 2009, POMA honored Vickie Gardner, VP of Stuff and Marketing with Alpen Optics. Russell Bailey isn’t a POMA member. He doesn’t even work in the outdoor industry. 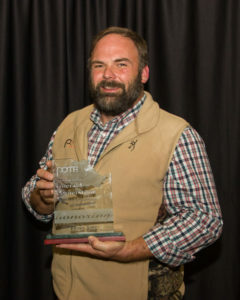 But, he’s one of POMA’s most dedicated volunteers and one of the most important people to ensuring the POMA Annual Business Conference and specifically the Corporate Partner (CP) events at conference, Shooting Day and POMA Camps, come off seamlessly. The award is presented to individuals whose volunteer efforts in assisting the organization go beyond the norm… they are extraordinary. 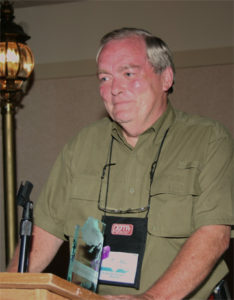 Bailey was honored as a recipient at POMA’s 2011 Annual Business Conference in Ogden, Utah. Bailey was introduced to POMA when his wife Shelly, became POMA’s membership director in 2006. Bailey traveled with Shelly to POMA’s first conference, and hasn’t missed a conference since. Kevin Tate, Vice President of Media Productions for Mossy Oak, was awarded the Betty Lou Fegely Emerald Cornerstone Award at POMA’s 10th Anniversary Business Conference, in Springfield, Missouri. Tate has served on the Board of Directors, and held the Chairman position twice. During a difficult time in POMA, involving board staffing issues, Kevin stepped up and returned to the helm of the organization. 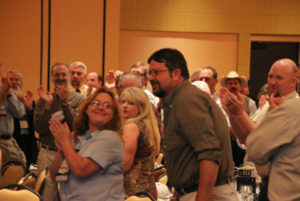 Not only did he assume the normal duties of Chairman, but he again helped plan POMA’s 10th Anniversary Business Conference along with POMA’s Membership Director, Shelly Moore, and Lisa Snuggs, Executive Director of the Southeastern Outdoor Press Association (SEOPA). “Kevin’s leadership and support of POMA over the years has been unsurpassed and greatly appreciated, especially during our recent Executive Director transition. He stepped in and righted the ship and got us back on course. He is a consummate professional and a great person in general.” said Moore.